When T was shot, the bullet passed through his abdomen, and exited his lower back. By Michael Holland, Oakland Voices 2012. To protect his identity, the shooting victim’s name has been changed. On Saturday June 30th, a young man was shot on 50th Avenue and International Boulevard. The fact that someone was shot on the infamous streets of East Oakland was not too surprising. Lately, people seem to get shot in Oakland almost everyday, at all times of the day. Like many residents, I watch the local news and read the Tribune to find out what crimes happened overnight. So when I found out about the shooting on 50th Ave., I had no idea that the victim was someone I knew. No one involved had their names released. The story was, as usual, a bunch of nameless, faceless people involved in another shooting. Later that day, I found out that the victim was a young man named T, whose family I know through my in-laws. He comes from a solid and stable home, and has never been involved with gun play. His family has a long record of charity and service to the city of Oakland. I know him to be an athletic and intelligent teenager with excellent manners. Finding out T had been hurt made me reflect back to earlier in the year. He and I helped a near and dear friend move some things around in a storage locker. He struck me as a bright-eyed, almost innocent young lad. I monitored his recovery through my stepdaughter, who is very close to his family. He underwent surgery after surgery. The doctors at Highland Hospital’s trauma unit worked on him around the clock. As time went by information surfaced about the shooting. It was a robbery attempt. T was on his way home when two young black men approached him, demanding his iPod. One of them pointed a gun at T’s stomach, firing two rounds which struck his large intestine and his bladder before exiting through T’s lower back. I wanted to check in to see how he was healing, and I wanted to hear from him more about the assault. So last week, I met with him at a family home in East Oakland. The house was well furnished and the padded carpet was so clean, I thought I should take my shoes off. My eyes wandered around the living room, and landed on T, whom I saw through his bedroom doorway sitting with a computer on his lap. He looked surprisingly well. He’d even grown a bit – at least 3 to 4 inches since I last saw him. For someone who had been attacked and shot, T seemed pretty calm, and we spoke casually about the incident. He told me that the would-be robbers did not get his iPod. We laughed. But as we laughed, T grimaced. He was hurting bad. He then lifted his shirt to reveal entry wounds. When I saw the scars at his front lower abdomen, the thought crossed me mind that the shooter may have been trying to kill him. For now, he’s taking things day by day. The experience has forced T to change his routine. Things he used to do with ease, like playing sports and participating in school, are now almost impossible. He plans to be home schooled next year. His intestinal health has been at risk since the botched robbery. I pray that he has a speedy recovery. As we spoke, I didn’t notice any animosity in T’s speech toward the shooter. It was almost as if he had already forgiven them. Besides, there are no suspects in the case, and in a city like this one you have to get killed to create a buzz. Like many of our Oakland youths, he has been forced into a situation that is beyond his control. 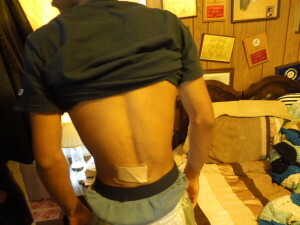 He was headed to the safety of home when he was shot. His iPod made him a victim. Times are tough now, and apparently people are willing to commit attempted murder for the resale value of a little digital audio player. In east Oakland there isn’t an abundance of industry, and jobs are scarce. People have been left with no alternative other than creating their own income, doing what they can to survive, even at the risk of another’s life. When those two guys confronted T, all they seemed to be going for was his $200 iPod. Although they didn’t get it, they took a lot more. A kind, energetic kid has been robbed of the chance to make his last two teenage years healthy ones. Now he has under his belt the experience of being a shooting victim. A young man with so much life already wrapped up in something so deadly. Thank you for the article. It really rings true, when you say “Like many of our Oakland youths, he has been forced into a situation that is beyond his control.” How true that is in both a large and small scale. This shooting happened right outside the car wash, which is right next to my house. It’s getting worse in Oakland. A lot of senseless violence. We need to continue to spread messages of peace in Oakland. Did the young man put up a fight, or was he just shot for no reason other than the ipod? Great story Michael! I was engaged the whole time. You’re a good storyteller!